There’s a trendy new lunch spot for those who live and work downtown, and the creator behind it is just 24 years old. 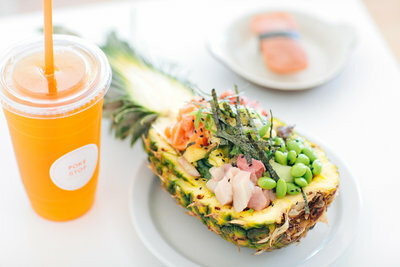 Poke Stop serves poke bowls, a sort of “Hawaiian fish salad,” according to creative mind and manager Jina Choi. The portions are not only filling but quite generous and will definitely provide a delicious leftover snack. The portions are generous because Jina understands the college budget and wants to provide quality food at a desirable price for students. Nothing screams Eugene more than healthy, whole fresh food... From bubble tea to pineapple boats, this is every college food's dream! Chalk it up to skyrocketing popularity on social media and one well-oiled poke assembly line. And hey, it's not everywhere you can get Flamin' Hot Cheetos on your poke bowl.